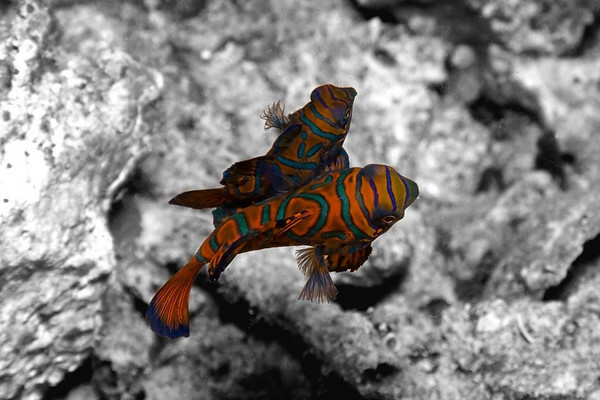 Spawning Synchiropus splendidus (mandarinfish). Every day, they come out just before dusk in the same place. The male and several females play a game of hide-and-seek peeking at each other round the rocks until the light starts to completely fall off. Then they start to come together, and as they perform, they shiver and float upwards. However, they won't do it if a light is shining on them, so one has to wait until they start the act, then swing the camera focus light across, focus, and get a picture all quite quickly. Not as simple as it might sound!